Years ago, when I first discovered films, and I started to absorb all the information that I could from guides and reference books, I came across the Sight and Sound ten-yearly lists of the greatest films ever made, as voted for by an august group of film critics. There was a sense of awe at titles I had yet to see, such as Citizen Kane, Bicycles Thieves, Ugetsu Monogatari or Battleship Potemkin, and fascination at how changing tastes brought new films into favour and old certainties fall away with each decade’s new choices. In 1982 I eagerly devoured what was the fourth to be held, where Citizen Kane retained its top place (I had seen it by then and respected it deeply), followed by La Règle du jeu, Seven Samurai, Singin’ in the Rain, and so on. I naturally thought of what my own top ten would be and wondered if anyone would ever seek out my opinion – unlikely since I had neither the ambition or ability to be a film critic. I would like to invite you to take part in the 2012 poll. We realise that this is not the easiest of tasks, but we want you to know that this is a major worldwide endeavour that will help us all to remind people of film’s rich history and to refine what we mean by the best of cinema. Please draw up a list of ten films only, in order of preference or, if you’d rather, alphabetically. The order does not matter to the voting system – we will allot one vote only to each of your ten films. We also invite you to add a short commentary after the list explaining why you have chosen the films in your top ten. interpretation. You might choose the ten films you feel are most important to film history, or the ten that represent the aesthetic pinnacles of achievement, or indeed the ten films that have had the biggest impact on your own view of cinema. I no longer know what makes a great film, nor how a film can stay great, since so many that I once revered have dulled through familiarity, while others previously spurned when seen again startle with unexpected brilliance. The films I have chosen are not so much the ‘best’ as films that I could not imagine being done any better. Each is innovatory in its own way, which may explain the bias towards early films – all the good ideas were fresh then. The earliest title in my selection is a motion picture older than film itself, ushering in a new way of seeing the world. The newest is the first title to appear on YouTube, the symbolic moment when the medium reinvented itself beyond ‘film’. 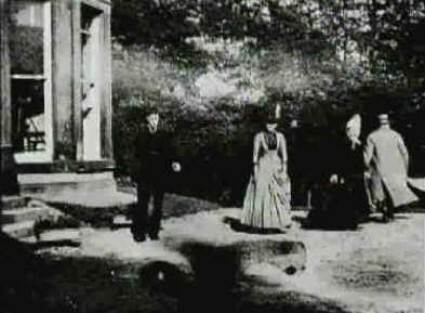 Le Prince’s 1888 record of his family playing around in their garden does indeed precede the medium of film (it was shot on photo-sensitised paper). It seems to me to do what the moving image does best, at the very beginnings of what came to be called film. The film by Lumière cameraman Gabriel Veyre is a breathtaking reverse tracking shot taken in a Vietnamese village in 1900 (you can see in on the Gabriel Veyre website) – a superb demonstration of documentary imagination. The Big Swallow is film’s wittiest comment on itself, in which the irate subject of a film swallows the cameraman. L’aveugle de Jérusalem, an imaginary parable, is an obscure choice, though Feuillade is a celebrated enough name. But for me it is the perfectly constructed one-reeler, which I have praised here before now. The documentary The Battle of the Somme made a greater social impact in its day than probably any film since (in Britain at least) and though more shocking films of war have been made since, as I wrote in my review of its DVD release, “it is a profoundly memorably expression of the hopes and fears of its age.” The unaffectedly authentic western The Lady of the Dugout has also been lauded here before now – in its modest way it is the model of what a silent feature film (or any feature film) can be. Spare Time is an artful yet genuine record of people at leisure, profoundly sympathetic towards people of all kinds, delighting in scenes of ordinary living in a way that film does best (but not nearly enough). Free Radicals is pure avant garde, from the exuberant Len Lye, the most free of all filmmakers. Topsy-Turvy is a token film from today, but its marriage of precise historical recreation with truth about human loves and follies seems to me to be perfectly done. And then Me at the Zoo (which I write about on my Moving Image blog) takes us back to Le Prince in a way, demonstrating how the moving image medium delights in almost nothing at all, just movement itself. And it is the point where film ends, and something else takes over. You can find my choices along with the 845 others on the BFI’s Sight and Sound poll pages. But seeing what I wrote, and thinking why I wrote it, has made me decide that it’s time to call a halt to writing about film, at least for the time being, and in this form. I’ve been writing for the Bioscope for just over five years, and I’ve probably said all I want to say about silent films. It’s become a chore, and I want to be doing other things. So as of now there will be no more new writing on The Bioscope. It will stay online, because the intention was for it to be an archive of lasting value, and the links will stay on the right-hand side, but over the next couple of days I’ll be removing news of festivals and conferences and shutting down the Scoop-it news service and Twitter account. I’ll also be shutting down comments. Thank you all old friends and new for having read the blog over these past five years, and for often having said such kind things about it. But it’s time to move on to the next venture, whatever that might be. Luke, I’ll miss The Bioscope, but I thank you for maintaining the site for as long as you did. Good luck to you in your next venture. Aw, I will miss the updates. You have been a font (or is it fount?) of knowledge and one with a flair for the interesting and unusual topic. The quality of your postings has been one to aspire to, God knows I’ve never come close. Good luck with your new/next venture and remember there are plenty of friends out here who wish you nothing but the best. To echo the above, and add that your postings have been massively helpful when relevant, and enormously fascinating even when outside of my particular research focus. I think you have more than deserved your early retirement from the blog, but will still feel bereft without The Bioscope enlightening the inbox. Thanks so much – and for your generosity to us all in leaving the site for us to scavange for resources. If you ever feel inspired to start up again let us know! I’ll miss coming here to see what news or insight you have to offer, but it’s always better to leave early and leave them wanting more. Thank you very much for creating The Bioscope, writing it – and keeping it online. If it has become a chore, then it is time to call a halt……..I sincerely hope a temporary one, but if not….no-one could have asked for more these past five years. I’ll miss the lightly-worn erudition, the humour, the humanity and the jaw-dropping breadth of scope – and somehow attention to fine details too – that your posts all contained. The Bioscope has been a model of its kind and will be sorely missed in our world…….thanks for all your efforts, and may your future ventures be as successful. I hate to see you go, but I know what it is like to become interesting in other activities and research. Thanks for all of the great knowledge that you have shared the last few years. I have to give The Bioscope a lot of credit for renewing my interest in early cinema history and helping me dig deeper into silent film history in general. I, too, hate to see it go, but I’m grateful it will remain online. Good luck with whatever you take up afterward — and many thanks. Thanks for having sheared so much valuable information on silent films, and as we say in Spanish: Buena suerte. I used to let the “unread” counter in my RSS feed reader go to four or five Bioscope articles, because one of my favorite indulgences was to read these gracious, detailed, educational, and always enjoyable posts. I appreciate that you put so much time into them, and that the effort can’t be indefinitely sustainable. Please let us know of your next ventures! Luke: This was the saddest news of the day, but you are right: If it isn’t fun, you should at least take a break. Thank you for the wonderful information and ideas you have shared with us these five years. I’ll come back and reread many of your items. Good luck with your future ventures. Thanks for all of your work over the last five years. Your updates and listing of sources have been a real contribution to the continued study of, and interest in, early and silent film. Good luck with your new projects whatever they may be. You have brought an incredible amount of insight and hard facts into this site. I owe you a lot and wish you good luck and inspiration in whatever you do. I can’t hide that I very much regret not reading new posts at The Bioscope, you were an inspiration Thank you! Good luck with the next ventures. Mi dispiace moltissimo…. grazie di tutto Luke! This is sad news. Your blogging has been consistently excellent, and inspirational to newbies such as myself. Best wishes for all your future projects. Let me add another fond farewell and thank you for all the years of doing a terrrific silent film blog. lets hope that you miss doing it real soon and return for more. Thank you everyone for such generous comments. I have made a lot of friends through the Bioscope, and it has been good to know that some of what has been written here has been of use to others. A blog can’t go on forever, and I think the thing to do is to look on the Bioscope as a work that is now completed, to be enjoyed and used henceforth as reference work, as it now turns from blog to archive. I must also note the special contribution made by those who have written posts for the Bioscope over the years – Bryony, Stephen, Frank, Buckey, Janet and the Mysterious X. My grateful thanks to you all.